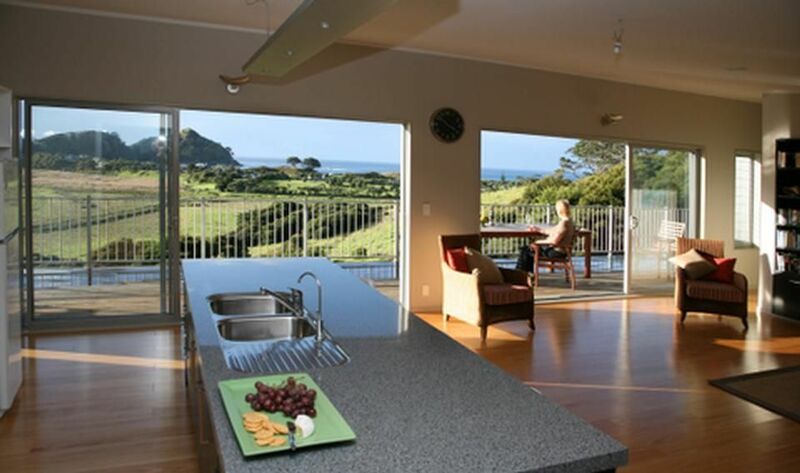 Medlandsview Beachhouse is a new contemporary open plan design comprising kitchen, lounge area, three bedrooms (two opening to large deck) with glorious sea and valley views. This is ultimate luxury accommodation to relax, unwind and enjoy the sounds of the surf and native bird life. Equipped with full range of amenities and furnishings of high quality. It is a spectacular surfing beach and also a very nice 40 minutes walk from one end to the other and back. Fabulous beach for a swim. Claris is a 6 minute drive, which has a grocery store, also a bottle shop. Clean, tidy, and modern house with amazing views over Medlands beach area, would definitely stay again. One of the best in Medlands. Perfect property to stay at with all amenities that you would expect.Great views from the deck and a nice open plan kitchen and living space. An easy short walk to a fantastic quiet beach. Wow. This property exceeded our expectations. Incredibly well kitted out and a magnificent view. Thank you so much for having us. We had an absolutely lovely stay. Everything was perfect about the house, and it worked really well for our small group. Very central on Great Barrier Island and only a short walk to the beach. Very central on Great Barrier Island and only a short walk to the beach. We did note that other properties further down would not have the lovely views we had from this place. The views are from bedroom and living area. A terrace back and front to catch all the sun.